April 12 (Wednesday), St. Petersburg, Mototrack - "Udelnaya" station, pr. 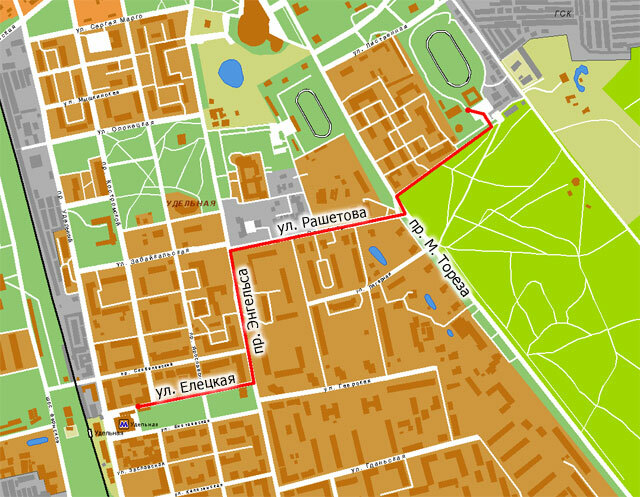 M. Toreza, 71A (near "Sosnovka" park, through the checkpoint to the left). Beginning at 20:00. Entrance - 150 RUR. BARDOSENETICCUBE is one of the oldest St. Petersburg-based industrial projects and it was formed in 1997 by Igor Potsukailo and Sergey Matveev (now plays in Intershum). The most precise definition of their music is surrealism. According to the description given by A. Breton, surrealism is "pure psychic automatism willing to express the real functioning of the reflection either orally or written, or in any other form. Dictation of mind without any control from the intellect, outside of any aesthetic of moral considerations". During it's lifetime the project has released more than 20 albums in Russia and abroad, took part in various compilations and festivals (SKIF, Free Flight, etc.). Bardoseneticcube was involved in several sound installations ("Emplacement", "Contact with the Microworld" together with multimedia project 2012). The project's live shows are usually supported by video which is considered the integral part of the performance. This is always improvisation in which both listeners and acoustic characteristics of the space are involved. The live sound stylistically varies from techno-shamanic trance to the baffling harsh-noise. Application of the original sonic "system" and psychoacoustic apparatus allows the band to achieve the unbelievably wide frequency range, from infralow to ultrahigh. Big concert experience of project members and usage of protective devices guarantees the safety of sound equipment. ARCHITHEATRE is a composer union of two and more people. Any human being not suffering from pronounced (i.e. very noticeable) psychic and physiogical disfunctions and left in the past too sentimental attitude to any kind of music has the right to become a member of Architheatre. With all the obvious sympathy to practically all genres and styles of modern sound art, Architheatre prefers to treat them like to possible but not obligatory hallucinations, arising from the primordial chaos and quite soon dissolving in it. For today, the members of Architheatre are Andrey "Buratino" Emelyanov and Alexey Konovalov. JENSEITS. With their previous live acts this collective got the reputation of producers of heart-rending noise which musical colleagues laconically compare with "the cleansing of brain with metal brush - painfully, juicy and meaty". COSMODRONE. The members of this group - Nickolay Nickolayevitch, M.M. and Gosha Solnzev - already got on well in Russian experimental-noise scene in their solo projects Hladna, Kryptogen Rundfunk and Noises Of Russia. 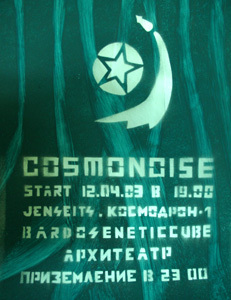 Armed with archaic but reliable Soviet analogue audio-technics supported by modern achievements in digital sound manipulations, three St. Petersburg-based musicians will try to find the universal harmony in the sphere of improvised cosmic drone-ambient-electronics.